Take a look at the exciting results collected from our growers during their 2018 growing season trials. Pivot Bio PROVEN™ - The first nitrogen-producing microbe that is changing the way nitrogen is applied to corn. Pivot Bio PROVEN™ microbes are applied in-furrow during planting. The microbes create a symbiotic relationship with the corn plant, produce nitrogen and deliver it directly to the roots of the corn plant. 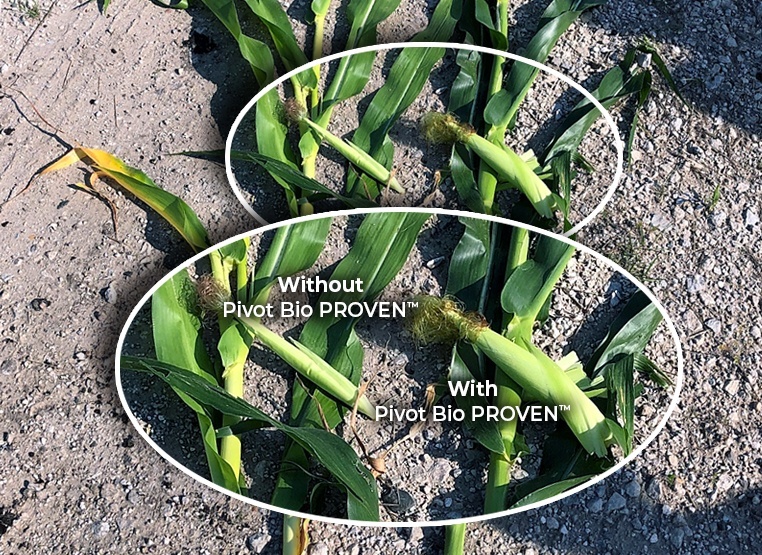 Pivot Bio PROVEN™ microbes continually feed nitrogen to the corn plant throughout the growing season with peak nitrogen production during the crops’ most critical growth stages. 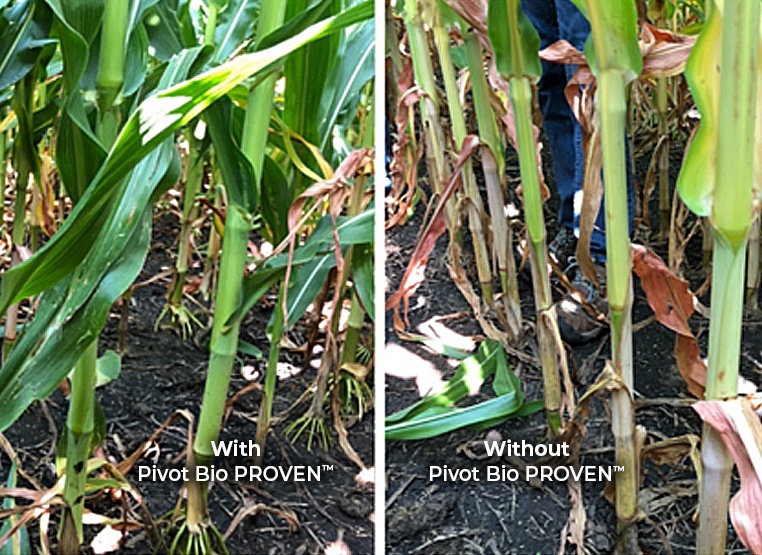 Pivot Bio PROVEN™ microbes adhere to the roots of the corn plant and will not run off during weather events. This supports a more reliable and consistent method for delivering plant nutrition. Pivot Bio offers farmers the first in-field microbial product to sustainably feed nitrogen daily to corn crops. Available in select states for 2019 planting, Pivot Bio’s first-generation product is an in-furrow application. Next gen seed treatment options are in the product pipeline. An acre of corn requires about one pound of nitrogen daily during its early stage growth. As the corn matures, the nitrogen requirements dramatically increase during this critical growth period. Synthetic nitrogen fertilizer has been a source of nitrogen during this growth stage as long as the nitrogen doesn’t leach, run off or volatize. When farmers use Pivot Bio’s nitrogen-producing microbes, they can have the confidence that the nutrients will be delivered to the crop. Our microbes adhere to the plant’s roots and aren’t washed away, performing consistently regardless of weather, topography, or soil type. In 2017, our microbes were tested in more than 5,000 field trial plots in over 100 locations. These studies helped us refine product concepts and better understand all the ways our microbes benefit crops while we set our sights on creating the 2018 Intent to Pivot Program for innovative farmers across the Corn Belt. 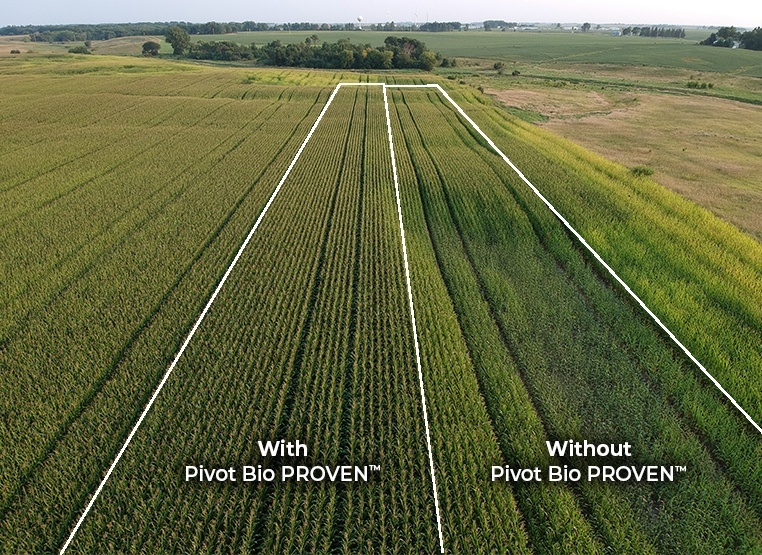 If you are interested in Pivot Bio PROVEN™ for the 2020 growing season, sign up here. While walking one of our Intent to Pivot plots, we found this plot with plants fueled by Pivot Bio’s nitrogen-producing microbes were producing much bigger ears of corn when compared to the rest of the field without our microbes. Our farmers are seeing it at other locations, across a variety of growing conditions, soils, and corn hybrids. We love walking the fields with growers! At this field, a plot without Pivot Bio microbes was planted adjacent to an Intent to Pivot Program plot. The plants without the benefit of our microbes had yellowing lower leaves, a sign of nitrogen deficiency. In the Intent to Pivot Program plot, the corn was greener. This was Pivot Bio’s microbes at work - providing nitrogen at just the right time, enabling better plant development. Our drone captured this startling differentiation between the Intent to Pivot plot, outlined on the left, and the plot without Pivot Bio microbes, pictured on the right. View our Safety Data Sheets (SDS) for all the safety information you need.